Put the prunes in a small container, pour over the vinegar and add just enough water to cover them. Soak the prunes overnight - they should soften and absorb most of the liquid - then stone them and reserve the flesh and liquid separately. Sweat the onion in the butter, allow to cool a little, then mince together the bacon, liver, cooled onion and butter, garlic, thyme and breadcrumbs, seasoning well with salt and pepper as you go. Chill the mixture to make it firm. Completely bone the guinea fowl legs to leave four flat rectangles of meat, being careful not to cut the skin. Spread a large sheet of cling film on the work surface. Lay the leg meat pieces next to one another, skin side down on the cling film, making sure that their longest sides are parallel. You should have one large rectangle about 40cm x 16cm. Season this rectangle with black pepper, then spread the mince mixture evenly over the rectangle, leaving 2cm clear along the edges. Cut the breast into four long strips, and lay these lengthwise along the middle of the mince. Lay half of the prune flesh along beside the breast strips, then roll the whole thing up, using the cling film to keep it tight, to make a large sausage about 40cm long and 6-7cm diameter. Then wrap the sausage tightly in tinfoil. Steam or poach the sausage in a fish kettle for 20 minutes, until a needle inserted into the middle comes out quite hot. Remove and chill overnight. Preheat the grill, unwrap the sausage, season all over with salt, then grill as quickly as possible to crisp the skin but not heat the whole sausage through. Allow to cool before serving. Make a dressing with the prune juice, mustard and olive oil. Arrange some rocket and sliced figs with the remaining prunes. 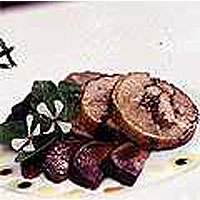 Slice the ballotine thickly, lay the slices on the salad and serve.